St. Thomas' has a strong reputation for the smart appearance of the children. We promote the importance of personal presentation as part of education for life. 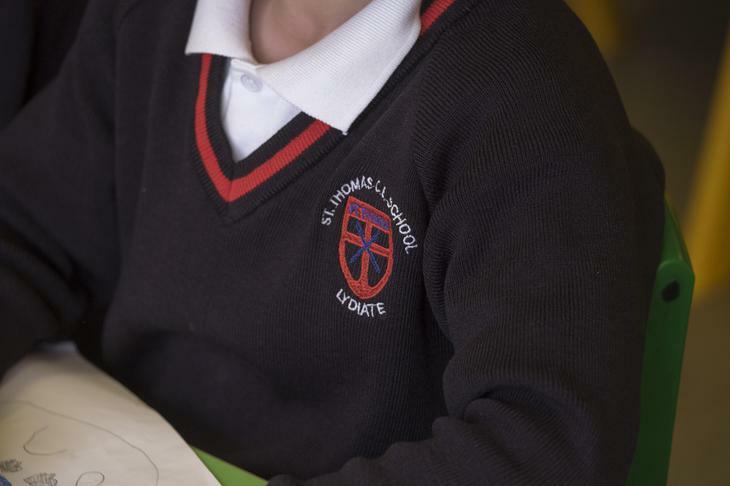 We ask that all parents who send their child to our school to support our school uniform expectations. All parents sign a home school agreement on entry to St. Thomas' stating that they will support school policies. We believe that parents have a duty to send their child to school correctly dressed and ready for the day. Dark grey trousers – long or short, grey socks, white shirt, red tie, all generally available. Navy pullover with red trim, available from Premier Sports, Ormskirk or Sefton School Wear, Maghull. Dark coloured shoes (not trainers). White polo shirt with school logo (available from Premier Sports, Ormskirk or Sefton School Wear, Maghull). Dark coloured shoes (not trainers) with grey socks. White or navy cap or sunhat. Dark grey skirt, pinafore dress or tailored trousers, white socks or grey tights, white blouse, red tie, all generally available. Navy pullover or cardigan with red trim, available from Premier Sports, Ormskirk or Sefton School Wear, Maghull. Dark coloured shoes (not trainers). Pale blue gingham dress, navy cardigan with red trim or pullover as above, white socks. White or navy cap or sunhat. Navy school coat with school badge available from Premier Sports, Ormskirk or Sefton School Wear, Maghull (optional) or sensible winter school coat which must be waterproof and with no logos (no hoodies/jackets). Dark shoes (no sandals) must be worn. Trainers and boots are not acceptable footwear for everyday use in the classroom. Children may asked to wear their pumps if the correct shoes are not worn. Boys and girls with hair reaching shoulder length must tie it back with a band in school colours - (red or navy blue). If your child attends school with their hair loose they will be given an elastic band to tie hair up with. Any hair accessory worn by your child should be discrete and either red or navy blue. Hairstyles which are deemed to be extreme are not permitted e.g. lines or patterns shaven into the hair. White t-shirt with school logo (available from Premier Sports, Ormskirk or Sefton School Wear, Maghull), navy shorts, black pumps, all kept in a drawstring bag with the child’s name clearly visible on the outside of the bag. Plain navy sweatshirt (available from Premier Sports, Ormskirk or Sefton School Wear, Maghull), plain navy jogging bottoms, black or white trainers. Plain navy blue or with school logo on, available from Premier Sports, Ormskirk or Sefton School Wear, Maghull. No jewellery should be worn in school, except for a wristwatch from Year 2 upwards (no smart watches), which must be removed before any physical education activity. No earrings – we ask if you wish to get your child’s ears pierced, you do so at the start of the summer holidays so they can be removed in September for school. We strongly recommend that Reception children have short-sleeved white shirts/blouses. We also recommend that girls wear elasticated skirts (not pinafores) as it is difficult for them to undress and dress for P.E. lessons.